Last week’s Stormwatch #1 revealed glimpses of the secret team’s history going back to the ancient past. One panel revealed a team of medieval Stormwatch agents led by the Demon Etrigan. 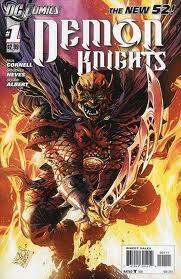 This week’s Demon Knights #1 contains the origin of that team, uniting Etrigan with Middle Ages DC mainstays like Madame Xanadu, Vandal Savage, and the Shining Knight. The word “Stormwatch” never comes up in Demon Knights #1, but given that Paul Cornell is scripting both Stormwatch and Demon Knights, the future promises plenty of connections between the two books. The story opens at the very moment of the fall of Camelot, as the knights of the round table leave the sword Excalibur behind when they take King Arthur off to Avalon until England will need him once more. I can’t remember if all the salient details line up, but a tiny part of my lizard brain is hoping that Cornell finds a way to tie in the old 80s maxi-series Camelot 3000 into this book, but that may be asking too much. As if to hammer home the idea that Demon Knights is going to be “DC Comics + Dungeons & Dragons,” the team even meets up in a tavern in the Dark Ages, some 400 years after the fall of Camelot. Etrigan and Madame Xanadu, who were both at Camelot when it fell, meet up with the Shining Knight, who claims to have also been there, but not to have seen them. This jovial take on the Shining Knight is not the same Sir Justin from the Golden Age of comics or the 80s All-Star Squadron, but rather a female (or at least very effeminate male) version of the character called “Sir Ystin”. I guess this is a Grant Morrison take on the character from a Seven Soldiers series I didn’t read, so whatever, let’s just go with it. Vandal Savage is also there, playing the “friendly barbarian” role in the party. Three new characters show up, and will evidently be joinging the team. They include Al Jabr, an apparently Muslim ambassador from “a far land” who apparently creates mechanisms, Exoristos, an Amazonian expatriate who looks exactly like Wonder Woman in a monk’s robes, and an unidentified female archer we see silhouetted by the sun from a distance. Their fun time in the village inn is interrupted by the marauding army of an unidentified Queen (is it Morgan Le Fay?) and her sorcerer prince, the wizard Mordru (who, believe it or not, got his start as a Legion of Superheroes villain in the 30th century). When Mordru detects that his outriders are encountering magical resistance in the village, he and his queen send in dragons. In this case dragons seem to consist of one big D&D style dragon and a handful of two-legged dinosaurs wielding daggers in their feeble little hands. Their appearance teleporting into the inn on the last splash page is, unfortunately, the low point of the issue, as Neves’s pencils are not up to the challenges of the script, and it’s extremely difficult to tell what is going on. The anatomy of one bar patron victim is so bad that it simply looks like it was drawn incorrectly. Or it’s possible his head has been chopped off and is flying right at you, but even if that’s the case, it’s still pretty poorly executed. It’s too bad, because I quite enjoyed most of the art in the rest of the issue. Etrigan looks really cool, and Neves does a good job giving character to Madame Xanadu personality with well-executed facial expressions. His Shining Knight looks great, and the medieval/fantasy world he portrays, if a bit cliche, looks right on the money. Cornell’s script here isn’t quite as clever as his script for Stormwatch last week, but his retelling of Etrigan’s origin in the early scene does a good job of making the story accessible, even though it is in fact dripping with minor cult characters and little bits of DC continuity. Demon Knights will not be for everybody, but it plays right into my interests, with minor DC characters I’ve always quite enjoyed. I think it’s going to be a lot of fun. Seven Soldiers was pretty great– it had some very Morrison flaws, but in the overall I think it had a lot of Morrison genius. Seven Soldiers was an uneven mess and I never bought it’s much-delayed finalé (even though it had great art) because I just didn’t care. Despite the weakness in the art this is still my favourite DCnU book, but that’s possibly because it’s full of some of my favourite minor characters and it’s the one I’d most like to draw. Pace, the finale is a little bit crazy– definitely all over the place– but I still adore it. Also, Klarion is like, my favorite. Klarion is awesome. And his name reminds me of Arion, who could be a cool character to bring into this series.